What is the difference between the shooting at Marjory Stoneman Douglas High School in Parkland, Florida, on Feb. 14 and the shooting at Columbine High School in Columbine, Colorado, on Apr. 20, 1999? 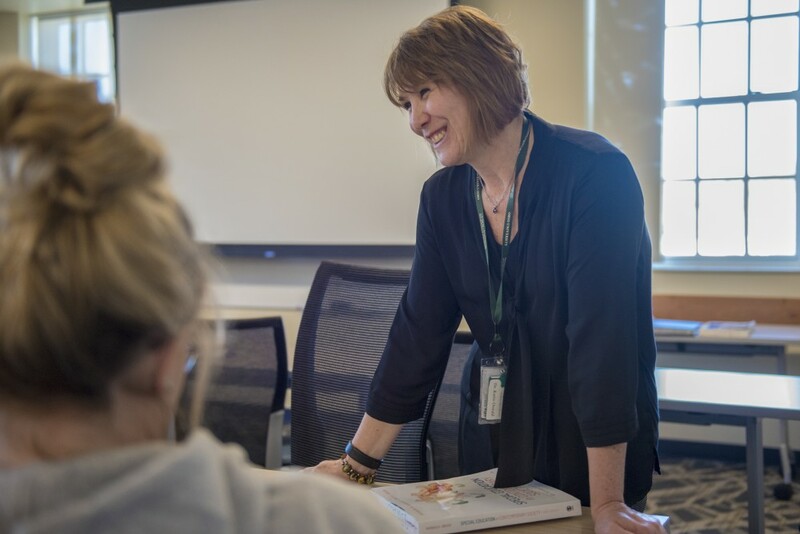 Senior lecturer Karen Oswald discusses with students during class in McCracken Hall on Feb. 27, 2018. That was the difficult question students in Karen Oswald’s introduction to special education class discussed after the shooting at Stoneman Douglas High School. Oswald, a senior lecturer in the Patton College of Education, said what happened at Columbine was assumed to be a one-time occurrence. After Parkland, though, Oswald noticed a difference in the reception of messages by adults. For Patton Dean Renee Middleton, the advocacy by those students is what the college is encouraging its teacher candidates to be. “What we expect is for our teachers ... to be with those students, to be encouraging them to find their voice and to understand that they have to change the world they want to live in,” Middleton said. Middleton said the college is not planning to change the way it trains teachers. “What you see these students doing, that's the sum total of what we are preparing our teachers to be,” Middleton said. The connection Oswald’s class has made between Columbine and Parkland involved manifestation determination — the process of deciding disruptive behavior, such as soliciting drugs or carrying a firearm, is a manifestation of a child’s disability, Oswald said. She said her understanding is that the shooters in Columbine or Parkland did not have individualized education programs, or IEPs, but were socially maladjusted. The disclosure of students' participation in IEPs is protected under the Family Educational Rights and Privacy Act, or FERPA. “They may have mental illnesses or mental brain disorders but they're falling through the cracks and going unnoticed,” Oswald said. During in-class discussions, students talked about how important it is to step out of the classroom, step into the hallway and interact with all the children in their school, Oswald said. One program available to students and faculty for an active shooter situation is ALICE training, a program provided by the Ohio University Police Department that helps people create a plan for a crisis. Perianne Bates, a senior lecturer in Patton, said when she received training she was taught to close and block the door then corral students into a closet. The OU chapter of the Student Council for Exceptional Children is planning to host an ALICE training sometime after spring break, Oswald, who is the faculty adviser, said. Middleton said in an email that the Patton curriculum includes “trauma informed” practice. Patton has also held a community forum on “trauma informed practice” to help the community, teachers and teacher candidates understand and see the signs of trauma. The practice is a prerequisite to enabling effective learning, Middleton said. Correction: A previous version of the headline incorrectly identified the Patton College of Education. The headline has been updated to reflect the most accurate information.